An innocent house on Staten Island, New York? So, you might ask, what did this have to do with Giuseppe Garibaldi, the Italian revolutionary of the nineteenth century and a key participant in the Italian Risorgimento? 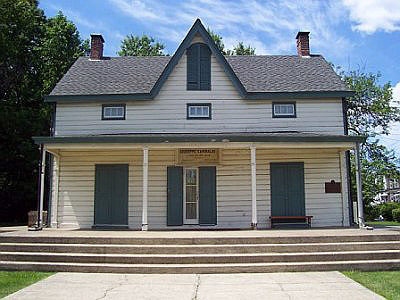 The Garibaldi-Meucci Museum on Staten Island. Photo credit. Note: "Risorgimento" (Italian meaning revival, or resurgence) is the name commonly associated with the Italian unification movement which took place from maybe 1815 until 1871. I am not sure, but the movement may have taken its name from the liberal newspaper il Risorgimento, founded in 1847 by Count Camillo Benso di Cavour (1810-1861), another one of the key figures in the Italian movement. There is no doubt about it, Giuseppe Garibaldi (1807-1882) saw a lot of the world during his long and active life, a life of adventure, action, danger and revolution, the stuff of legends. Born in Nice--the city is now part of France as a result of a deal between France and Piedmont-Sardinia for French support in the Piedmont's 1860 war against Austria, which is kind of discussed below--Garibaldi was born into a family of sailors during the upheavals of the Napoleonic wars. He eventually took to the sea, even as a ship's captain, but his life changed forever in April 1833 when he visited the Russian city of Taganrog on the Black Sea. There he met an Italian immigrant who was an active participant in Giuseppe Mazzini's secret movement La Giovine Italia (aka "Young Italy"). Mazzini (1805-1872) was another key player in the movement for Italian unification on the basis of a liberal republic, and it was his secret society that Garibaldi joined--Garibaldi later met Mazzini himself, but while they had roughly the same goal of a unified Italy, they were never friends or close collaborators. Anyway, Garibaldi was now set on a path of radical, revolutionary activity, and I have introduced you to the three key players in the Risorgimento (Garibaldi, Cavour and Mazzini). The Italian revolution did not start well. In 1834, after a failed uprising in Piedmont, Garibaldi fled to France and then overseas to Brazil. There he fought with rebels against the republic of Brazil and met his first wife. Some years later he and his wife moved to Uruguay where he organized some Italian exiles to fight for Uruguay against the Argentinian government (dictatorship). Popular legend claims that it was in Uruguay that Garibaldi and his volunteers first wore the famous "red shirts" which later became the symbol of Garibaldi and his followers. When news of the revolutionary outbreaks in Europe in 1848 reached Garibaldi, he decided to return to Italy with some of his supporters. But again, the Italian revolution did not go well. Garibaldi tried to work with King Charles Albert of Piedmont-Sardinia, but when the king did not return Garibaldi's support, Garibaldi wound up instead supporting the city of Milan in a revolt against Austria. This, the First Italian War of Independence, did not end well. First the Austrians crushed Piedmont's army, and after a month-long siege, the French re-captured Rome and re-established the power of the pope there. Garibaldi had led the defense of Rome against the far larger French army, and with the fall of the city he fled towards Venice, taking refuge in San Marino with only a few hundred men. (One of the students in HIS 102 suggested that I check out this website from the Republic of San Marino The 1800's and Garibaldi because her great-great grandfather was one of those who harbored Garibaldi while he was in San Marino). Garibaldi was forced to flee abroad again. This time to New York where he worked as a candlemaker for a short time before again returning to work as a sea captain. (See the Garibaldi-Meucci Museum ). In late 1852 he left New York for Great Britain and then on to Italy. It wasn't quite time yet for revolution in Italy. Garibaldi settled on the island of Caprera off the coast of northern Sardinia and began to farm. But in just a couple of years, in 1859, the Second Italian War of Independence broke out as Piedmont-Sardinia again challenged Austria. This time Garibaldi was appointed a general for the revolution, and he raised a volunteer unit with which he won a series of victories over the Austrians. But the key in Piedmont's struggle against Austria was the support of France. Napoleon III, emperor of France, agreed to help Piedmont-Sardinia in exchange for the Italian city of Nice! (Garibaldi was not happy with Cavour's deal with France). This lead to the independence of Piedmont-Sardinia from Austria. Now, with the world following his exploits, Garibaldi and his men crossed the Strait of Messina (British help there) and marched northward towards Naples, which he reached on 7 September. He was unable to conclusively defeat the Neapolitan army without the assistance of the army of Piedmont, and it was also Piedmont which blocked Garibaldi's plan for a march on Rome--at the time, the pope was protected by a French army, and the Piedmontese feared French intervention in Italy if Garibaldi attacked Rome. Plus it was unclear how Catholics around the world would react if Garibaldi and his forces attacked the pope. (All of this was negotiated by Cavour, the consummate diplomat, which again Garibaldi did not like). Anyway, on 26 October 1860 Garibaldi met with Victor Emmanuel at Teano and recognized him as the new King of Italy, giving the king control over everything that Garibaldi had liberated in southern Italy. Garibaldi did not quite give up his intention to march on Rome. In June 1862, he sailed to Sicily to gather volunteers and then crossed again to the Italian mainland. The Italian government (under King Emmanuel now) had not approved Garibaldi's expedition and sent an army division to intercept Garibaldi and his volunteers. On August 28 the two forces met in the Battle of Aspromonte . Some of the volunteers were killed and Garibaldi was wounded in the foot, but Garibaldi forbade his men to return fire on troops of the Kingdom of Italy. The volunteers were taken prisoner with Garibaldi eventually being released back to his island of Caprera. But still Rome was not part of Italy. That was going to take some doing beyond Italian control, i.e., the process of German unification. In 1866, during the Austro-Prussian War, Italy allied with Prussia against Austria-Hungary in the hope of taking Venetia (the region around Venice) from Austrian rule. (This is sometimes called the Third Italian War of Independence.) Garibaldi gathered volunteers yet again, maybe upwards of forty thousand men, and defeated the Austrians at the battle of Bezzecca. Despite Garibaldi's victory, the other Italian forces did not fare well. In the end, the armistice that ended the war did allow Italy to seize the Venetia, but this was mostly due to Prussia's success versus Austria. When the Franco-Prussian War broke out in July 1870, Italy again supported the Prussians--this time against the French. The war lead to the recall of the French garrison in Rome, and so the Italian Army was able to capture Rome and the Papal States without Garibaldi's assistance. Rome finally became part of Italy. So, by 1871, Italy had been technically put back together again (for the most part). That unification effort had taken decades and required the efforts of Garibaldi, Cavour, Mazzini, King Victor Emmanuel as well as the French and Prussians. It was a long, drawn-out and complicated affair. The next step after the formal unification was to actually "create" an Italy inhabited by Italians. That required deciding what it meant to be an "Italian." Garibaldi died on the island of Caprera in his home on 2 June 1882 and was buried on his farm there. At the outbreak of the American Civil War (in 1861), Garibaldi volunteered his services to President Abraham Lincoln and was offered command of the northern forces. "Garibaldi was ready to accept Lincoln's 1862 offer but on one condition, said Mr Petacco: that the war's objective be declared as the abolition of slavery. But at that stage Lincoln was unwilling to make such a statement lest he worsen an agricultural crisis. 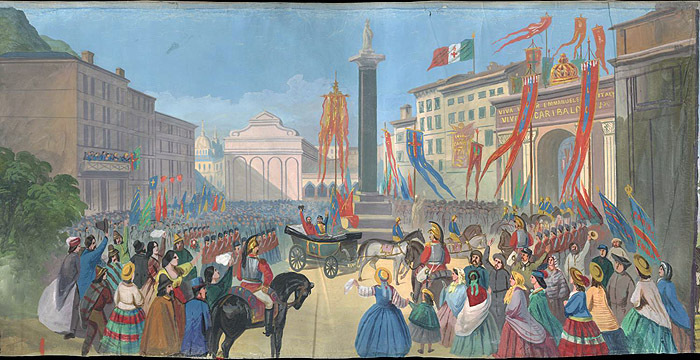 Garibaldi and Victor Emmanuel enter Naples in 1860. Photo is from the Garibaldi Panorama. The Anthony P. Campanella Collection of Giuseppe Garibaldi is a collection of materials from one of the major biographers of Garibaldi. Of course, there is the wikipedia entry. Life and Times of Giuseppe Garibaldi is a bit weird but overlook the religious tones. Garibaldi and the Risorgimento is a Brown University Library special project devoted to the Garibaldi Panorama. Garibaldi: An Autobiography is interesting, having been published in 1861 and edited by Alexandre Dumas. Two works (in Italian) by Giuseppe Garibaldi. These are his fictional works. i Mille Garibaldini. This is the list of Garibaldi's "thousand" Red shirts listed alphabetically by last name. il Patriota dei Mille: Paolo Bovi Campeggi. Some more information on Garibaldi and his men (in Italian). The Italian wikipedia entry is very good. In addition it includes lists of all the films that have been made about Garibaldi (it is a long list), the postal stamps on which he has been pictured, and images of all the statues and monuments dedicated to Garibaldi. Garibaldi en Uruguay (in Spanish) deals with Garibaldi's time in Uruguay. For extra credit please suggest to your instructor a relevant website for this unit of the course. Send the title of the site, the url and a brief explanation why you find the information interesting and applicable to the material being studied in this unit.